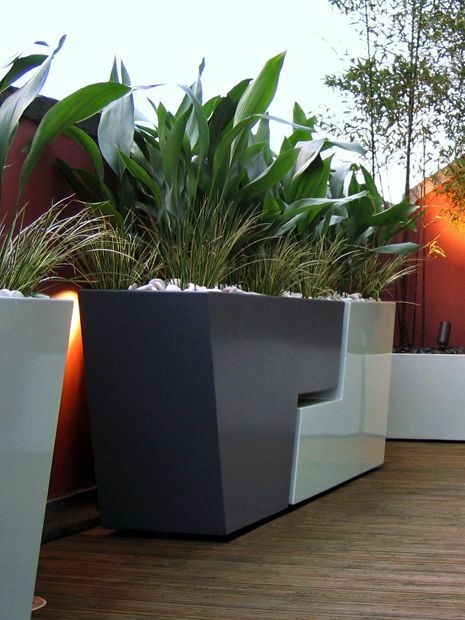 We design innovative bespoke outdoor planters for our London projects as integral parts of a specialist multidisciplinary garden design practice. 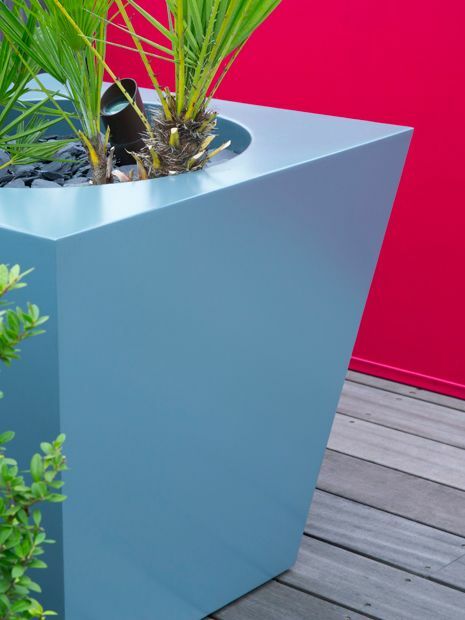 Manufactured exclusively in zinc-coated steel, and skilfully powder coated, countless planter prototypes are specified with built-in drainage outlets, safety brackets and movable castors. 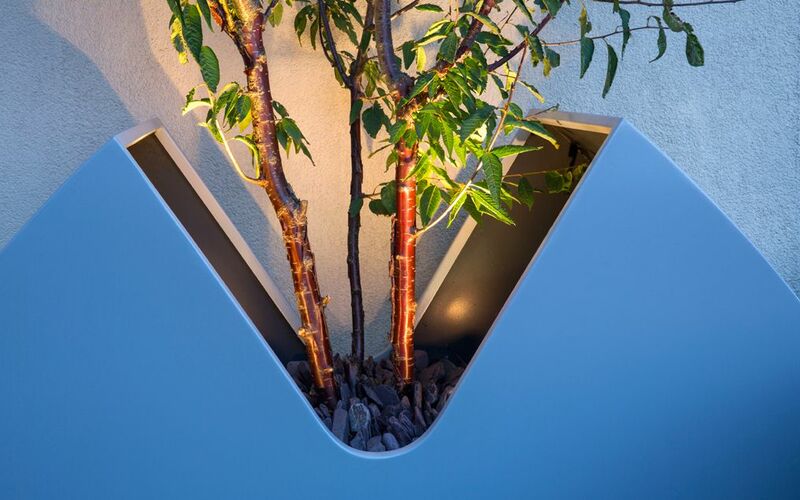 We utilise these one-off planters in gardens, patios, courtyards and rooftops to create sculptural focal points, continually experimenting with angles, curves, lighting, two-tone colours and screen printing. 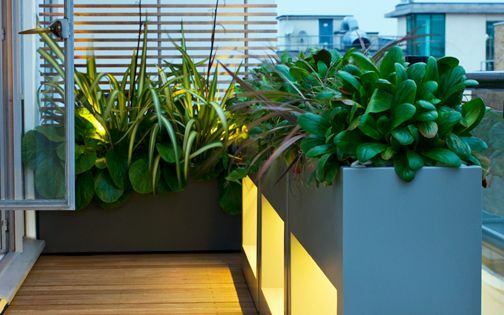 Every container is specially crafted to produce an optimal fit within each roof terrace design, where bespoke outdoor planters convey a distinctive, contemporary urban methodology: highly architectural, aptly low maintenance and invariably custom-made. 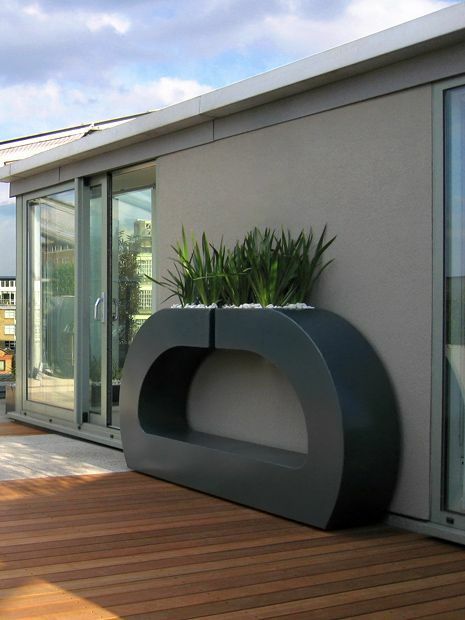 This seductive quartet of low curved vases is powder coated in a burgundy gloss finish to accentuate an expansively glazed elevation in a remarkable Shoreditch roof garden. We formed an uninterrupted view from a vast open-plan living room, via the low vases, to taller topiary planters in its backdrop, where a sequence from deep to light colour, and low to tall scale, maximises spatial depth in a particularly elongated rooftop terrace setting. With a lustrous radiant finish, the streamlined low planters define dynamic ambience in a north-facing aspect, and match the interior's arched ceiling. 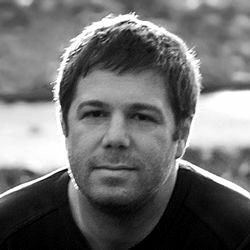 Libertia ‘Goldfinger’, an orangey, grass-like New Zealand perennial, generates contrasting form and texture, while infusing movement and tactility, alongside a minimalist hard landscape and an uncluttered penthouse apartment. The colossal panorama from this 16th floor penthouse duplex above Thames Barrier encapsulates London's vast skyline in its entirety. To portray the local history and immediate surroundings, we designed sizeable, custom-made tree planters for two roof terraces to express Thames Barrier's shapes, tones and textures and its park backdrop. 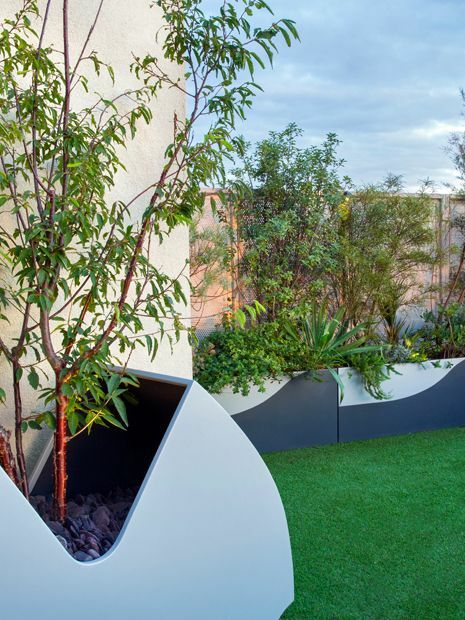 To balance these curvilinear focal points, we created a series of wave-shaped planters featuring coastal flora – powder coated in two tones to produce sinuous contours. 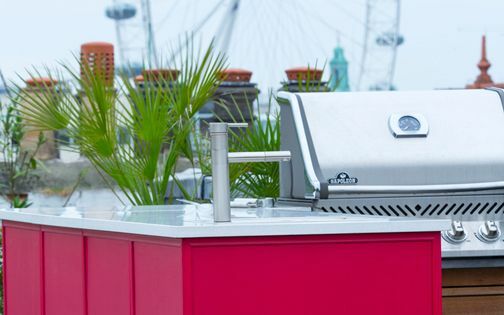 Both roof terraces are surfaced with artificial grass in two colours, infusing vibrancy and softness, while linking seamlessly to Docklands' Thames Barrier Park landscape. 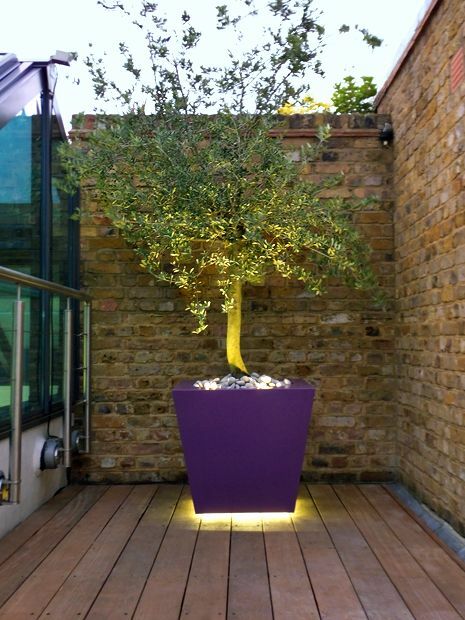 These mauve and heliotrope planters produce a vibrant roof garden sequence, while screening adjacent commercial offices. Designed for two sisters, the rhythmic duet element is enhanced by LED lighting below and sprawling culinary Thyme herbs up above, continued with scarlet flowering Australian Bottlebrush shrubs across the roofscape perimeter. 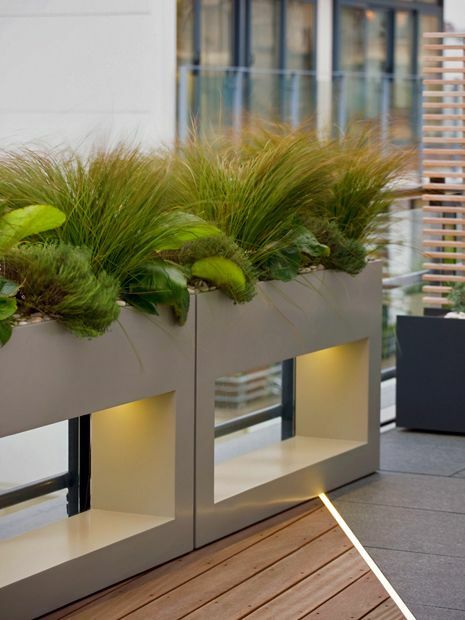 We utilised the planters' lower recess to increase sense of space along narrow passages, where even in such a large roof garden, the surface unveiled beneath planters augments perspective, while generating subtle, architectural roof terrace detail design nuances. The owners of this minimalist canal-side penthouse invited us to redesign their back terrace, following the main rooftop's completion by the living room. 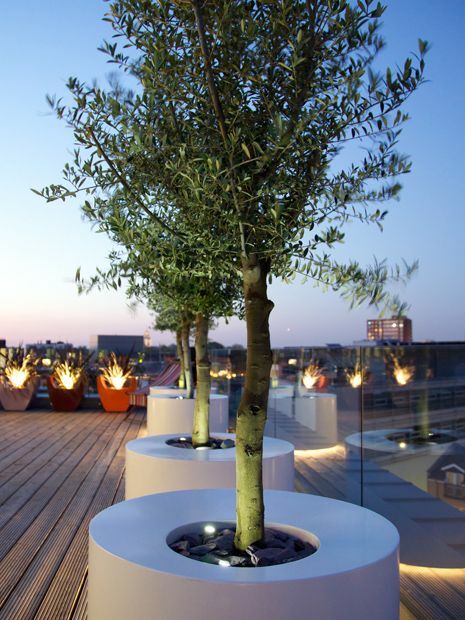 With an expansive Shard panorama, we included two Olive trees to define a better connected urban roof terrace. 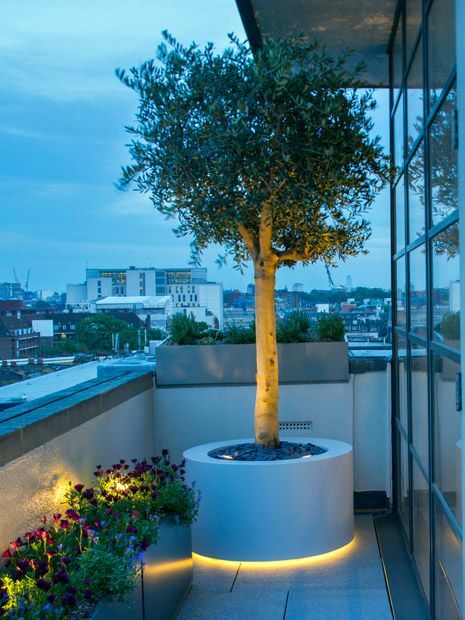 The taller specimen is featured in a bespoke cylindrical planter, where an integral LED afterglow highlights crystals in granite flooring, forming a focal point enjoyed from the master bedroom. 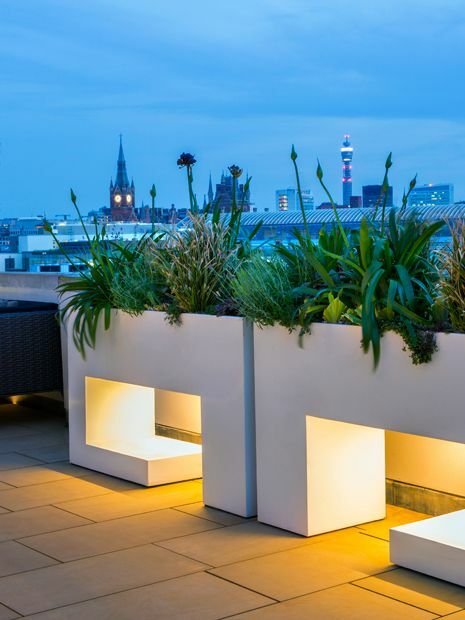 A white, matt powder-coating finish contrasts silvery granite flagstones, linear planters with Cape daisies and a herb trough fitted on the parapet wall to focalise the architectural elements of distinctly vivid roof terrace planters. 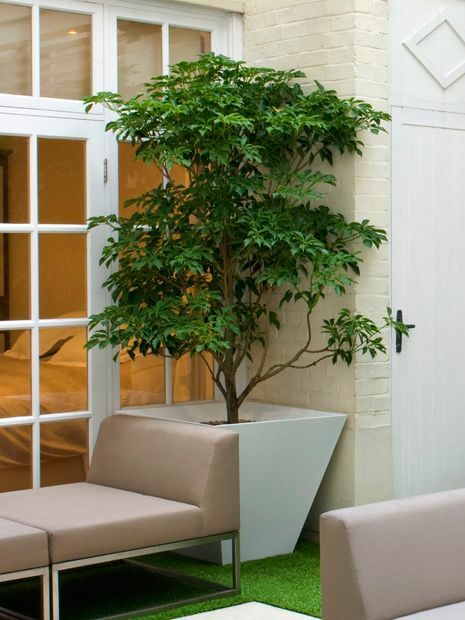 A discerning client inspires personalised design ideas, and in this Clapham Town garden, the planters were designed as tall punctuation marks to accompany a modern home renovation. 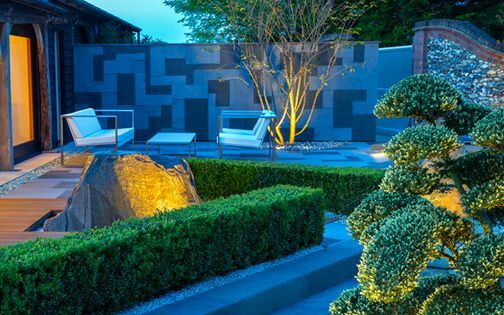 Subtle architectural curvature distinguishes the four-square garden space, adding further balance with upright Horsetails; powder coated in taupe, the planters' neutral hues contrast a deep maroon wall and dusky basalt paving. Commencing the design process at the refurbishment's outset, with a clear insight of our clients' vision for their interior, inspired a fluid town garden scheme – abundant in indoor-outdoor seamlessness. In this weekend country home, we devised a series of thirty one-off planters for London clients to enhance the elevations around their large-scale barn conversion. With outbuildings of varying architectural styles, scattered across a 5-hectare site, we designed a contemporary blueprint to fuse varied elements into a cohesive composition. Along the western outskirt, by a modern sports barn and its 8-metre-high roof, a trio of 1.2-metre-high, milk-white conical planters merges with rural Essex fields. Graceful Silver birch tree trunks form an engaging vista from a swimming pool near the house, adding refined contrast in a modern country garden, amid an agricultural backdrop. 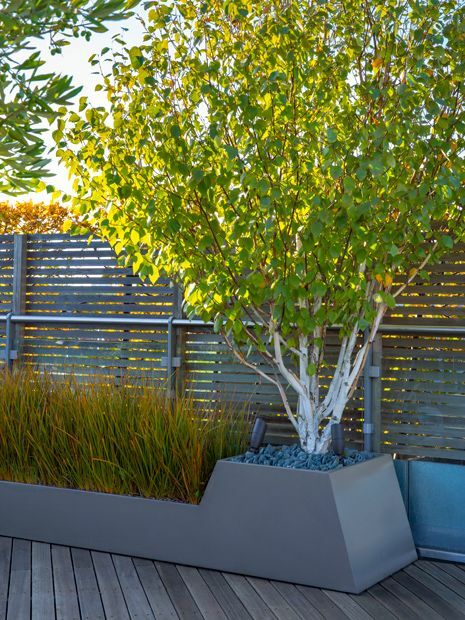 Sir John Lyon House' orange cladding inspired our planter design for this penthouse rooftop, where contemporary glass and stainless steel elevations narrate the building's architecture. 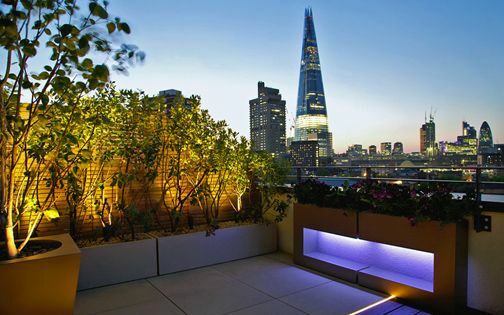 With proximate St Paul's Cathedral, we designed a classic shape within a modern context, and since every inch of space precious in this small rooftop terrace, the orange planters appear lightweight, floating on a square frame, while LED lighting projects inside their cavities, above Ipe decking. Agave americana ‘Mediopicta’, a variegated Century plant from Mexico, forms a sculptural display in two planters, positioned diagonally across the terrace. Interspersed among a verdant Mediterranean rooftop planting scheme, these succulents evoke the scenery of our clients' Portuguese garden. The blue hues of Millennium Bridge and Tate Modern's skyline highlight and contrast the Agaves' warm, varicoloured tones. 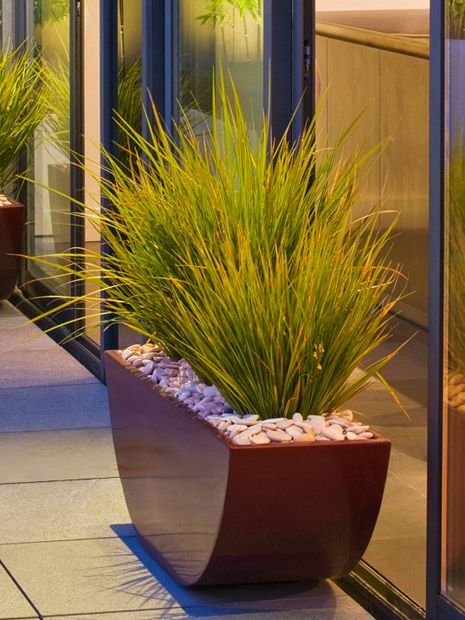 This 2.5-metre-long stepped planter mitigates its terrace's angularity, while providing a pivotal focal point. 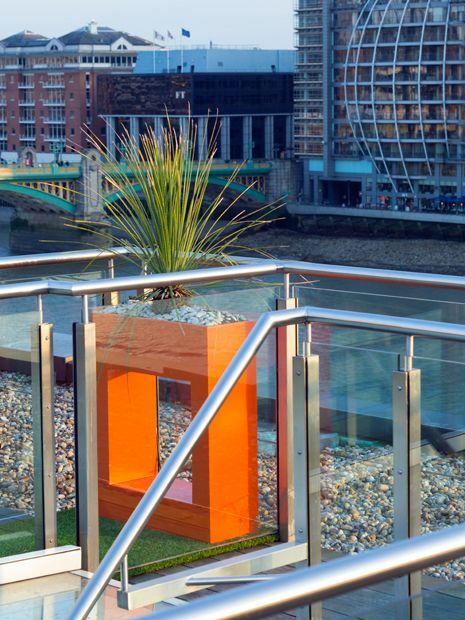 The entrance to this space is via a two-storey glass stairway, and when London's expansive city skyline is ultimately revealed outside a glazed pod at the top, a multi stem Silver birch emerges from its upper planter, contrasted by an orange drift of New Zealand grasses in a lower trough. A dynamic sequence unveils an urban landscape, where Big Ben is perfectly framed within London Eye, and defines a grand Chelsea Bridge panoramic view with its shimmering lights. The planter's angular side elevations follow the rooftop's linearity, reducing predictability and rigidity by forming underlying clarity, alongside contemporary roof terrace planting. 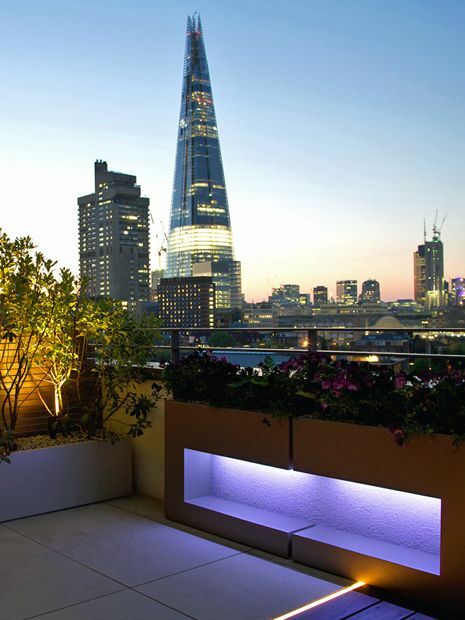 St Paul's Cathedral vista from this Clerkenwell roof terrace presents epic, up-close panoramas, where a definitive EC1 sense of place is gradually unveiled through a sensitively renovated duplex penthouse apartment. A series of modern artworks narrates a glass and steel continuum, with expansive, warm Walnut finishes which weave the interiors' layers cohesively, and had inspired our minimalist roof terrace ideas. We began by outlining a vision for indoor planters to complement an extensive art collection, followed by a matching sequence for three roof terraces which envelop the residence. 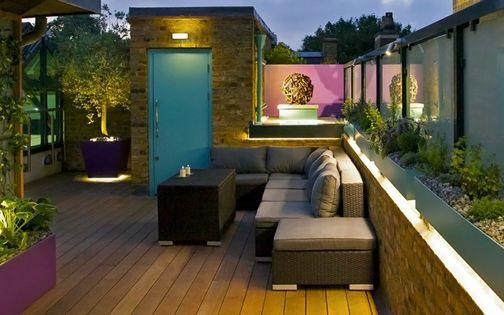 These interlocking duo planters were designed to create movement along the master bedroom's exterior elevation, linking their terrace into a surrounding roofscape of slate tiles and London clay brickwork. 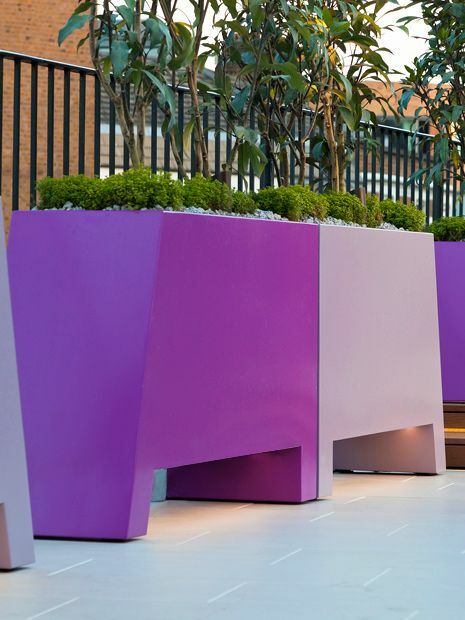 The planters were powder coated in contrasting agate and slate greys, accentuated by maroon tinted walls, while lighting produces a warm glow through gaps in their elevations. Soft Aspidistra foliage, the Bar room plant, is juxtaposed alongside variegated Acorus, a Japanese sweet flag, to form a luxuriant, tropical rooftop garden. Some of our small city gardens, courtyards and patios are crafted entirely with custom-made planters, similarly to roof terraces, where planting in the ground is often unfeasible. Utilising bespoke troughs improves drainage, and enables easy cultivation of species which are otherwise tricky to grow in a temperate maritime climate. 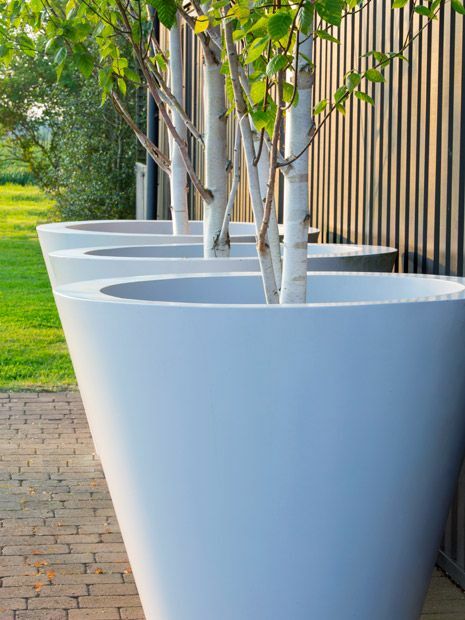 Exclusive one-off planters establish architectural, connective, free-standing focal points – enhancing distinction while highlighting our clients' unique individualities as staples of luxury garden designs. 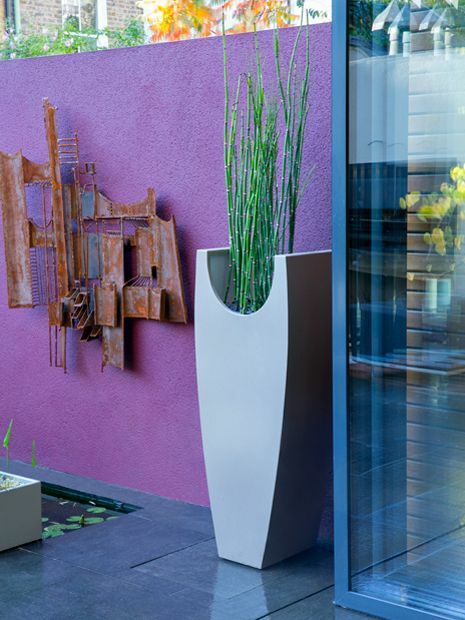 We design bespoke outdoor planters as definitive sculptural objects, producing distinctive, enduring essence for our clients. 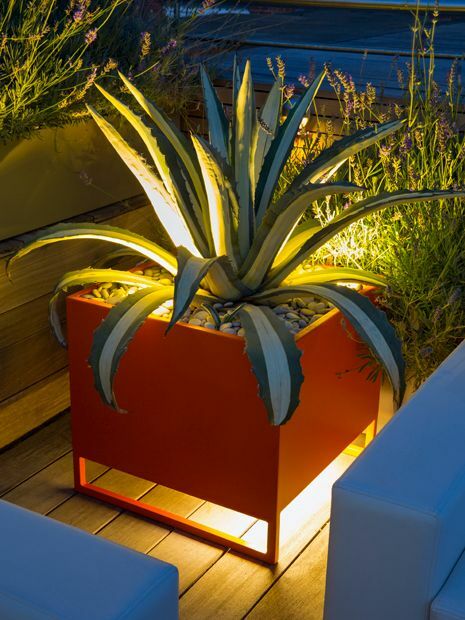 These opulent vessels are engineered to optimally fit each garden setting to assure the topmost streamlined appearance, where built-in drainage, lighting, irrigation, castors and secured brackets enhance many terrace garden designs invaluably. 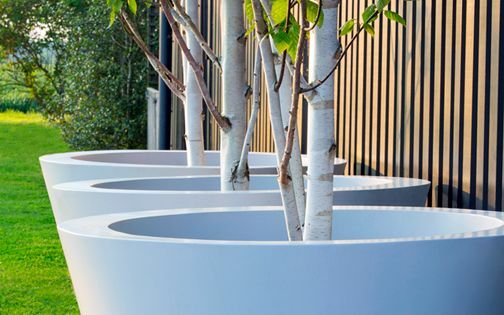 When a cohesive landscape scheme is augmented with custom-made planters, its robust outline purposefully highlights individualised, long-lasting and low upkeep architectural centrepieces within memorable and highly personal landscape designs.